The following is the high level overview of how the SDK works to simplify the process of validating a phone number within an application running on Android. A mobile application with the SDK installed. App requests to the backend to sign the phone number. Backend sends JWT to Android application. The Android app, with the JWT, starts the verification with the SDK. Twilio sends a formatted SMS (including a prefix and a hash) to the device. 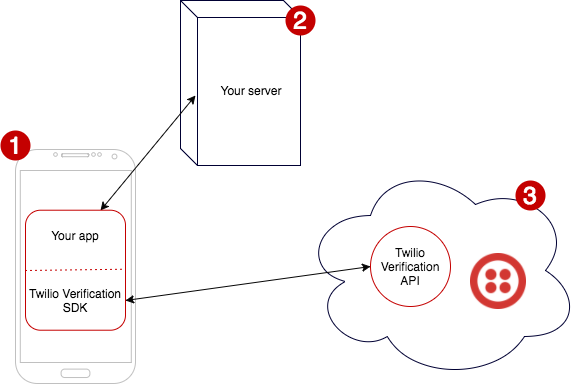 Twilio Verification SDK reads the SMS in the background and notifies the app. No SMS_READ permission is needed. The app with the provided result will have a verification token that is proof enough that the phone is valid. Along this guide we're going to implement a sample app from scratch, integrated with the Twilio Verification SDK and supported by a sample token server. There’s also a more complete sample app already implemented. Once the SDK is integrated in your app and your backend is capable of generating the JWT, you’re good to go.